All Sensors are Supplied with a Stainless Steel Transition with an A-Coded, Male, M12 Connector with Compensated Pins. Please Note That The Connector End of The Thermocouple Is Rated for Use From -50 To 85°C. 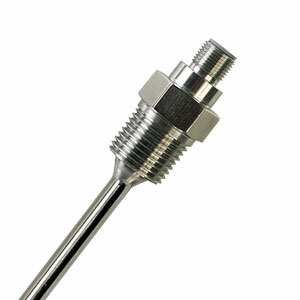 Omega's M12 Thermocouple probes are a convenient way to measure the temperature in your process. These thermocouple probes are available as Type K thermocouples with Inconel 600 sheaths, or as Type J thermocouples with 304 Stainless Steel Sheaths. Standard probe sizes include 1/4" & 1/8" diameter probes 6, 9, 12, 18 and 24" long, and 3mm & 6mm diameter probes 200, 350 and 500mm long. These thermocouples can also be provided in other lengths. With a variety of standard mounting threads, these probes can be easily configured to match your specific requirements. Fractionally sized 1/4" and 1/8" diameter probes are available with 1/2"NPT, 3/8"NPT, 1/4"NPT or with no mounting threads. Metric sized 3mm and 6mm diameter probes are available with M8x1, M10x1 or with no mounting threads. The non-threaded versions of the sensor can be used as-is or mounted into your process using one of Omega's line of Compression Fittings. For use in thermowells, the M12-TC-SL version of this sensor is the preferred solution. The M12-TC-SL design includes a non-threaded M12TC style probe with a self-gripping spring and 1/2NPT threaded fitting to insure that the probe will contact the bottom of the thermowell bore without damaging the sensor. This insures that the sensor length will always be a perfect fit for your thermowell. See the M12-TC-SL page for additional information. Type J Thermocouples have a 304 SST sheath with a 316L SST housing with a temperature range of -40 to 600°C at the probe end (see connector temperature range below). Type K Thermocouples have an Inconel 600 sheath with a 316L SST housing with a temperature range of -40 to 1150°C at the probe end (see connector temperature range below). M12 Connector has a temperature range of -50 to 90°C. Fractional sizes are 1/4 and 1/8 inch diameters with standard lengths of 6, 9, 12, 18 and 24 inches. Metric sizes are 6mm and 3mm diameters with standard lengths of 200, 350 and 500mm. Type J Ungrounded Thermocouple with 304 Stainless Steel sheathed, 1/8" diamater by 6" long probe and no mounting threads. Type J Ungrounded Thermocouple with 304 Stainless Steel sheathed, 1/8" diamater by 6" long probe and 1/2NPT mounting thread. Type J Ungrounded Thermocouple with 304 Stainless Steel sheathed, 1/8" diamater by 6" long probe and 1/4NPT mounting thread. Type J Ungrounded Thermocouple with 304 Stainless Steel sheathed, 1/4" diamater by 6" long probe with no mounting threads. Type J Ungrounded Thermocouple with 304 Stainless Steel sheathed, 1/4" diamater by 6" long probe and 1/2NPT mounting thread. Type J Ungrounded Thermocouple with 304 Stainless Steel sheathed, 1/4" diamater by 6" long probe and 3/8NPT mounting thread. Type J Ungrounded Thermocouple with 304 Stainless Steel sheathed, 1/4" diamater by 6" long probe and 1/4NPT mounting thread. Type K Ungrounded Thermocouple with Inconel 600 sheathed, 1/8" diamater by 6" long probe and 1/2NPT mounting thread. Type K Ungrounded Thermocouple with Inconel 600 sheathed, 1/8" diamater by 6" long probe and 1/4NPT mounting thread. Type K Ungrounded Thermocouple with Inconel 600 Sheathed, 1/4" diamater by 6" long probe with no mounting threads. Type K Ungrounded Thermocouple with Inconel 600 sheathed, 1/4" diamater by 6" long probe and 1/2NPT mounting thread. Type K Ungrounded Thermocouple with Inconel 600 sheathed, 1/4" diamater by 6" long probe and 3/8NPT mounting thread. Type K Ungrounded Thermocouple with Inconel 600 sheathed, 1/4" diamater by 6" long probe and 1/4NPT mounting thread. Type J Ungrounded Thermocouple with 304 Stainless Steel sheathed, 3mm diamater by 200 long probe and no mounting threads. Type J Ungrounded Thermocouple with 304 Stainless Steel sheathed, 3mm diamater by 200mm long probe with M8x1 mounting thread. Type J Ungrounded Thermocouple with 304 Stainless Steel sheathed, 3mm diamater by 200mm long probe with M10x1 mounting thread. Type J Ungrounded Thermocouple with 304 Stainless Steel sheathed, 6mm diamater by 200 long probe and no mounting threads. Type K Ungrounded Thermocouple with Inconel 600 sheathed, 3mm diamater by 200 long probe and no mounting threads. Type K Ungrounded Thermocouple with Inconel 600 sheathed, 3mm diamater by 200mm long probe with M8x1 mounting thread. Type K Ungrounded Thermocouple with Inconel 600 sheathed, 3mm diamater by 200mm long probe with M10x1 mounting thread. For longer length Type J, 304 Stainless Steel sheathed probes, change the "-6" or "-200" in the model number to the required length and add $0.50 per inch (or 25mm) to the price. For longer length Type K, Inconel 600 sheathed probes, change the "-6" or "-200" in the model number to the required length and add $0.65 per inch (or 25mm) to the price. To add the spring loading kit for use in thermowells (self gripping spring with 1/2"NPT hex plug fitting), add "-SLK" after the "-A" in the model number and add $20 to the price.